Preparing great tasting drip coffee at home is simple with a Capresso coffee maker, and today we’re sharing a few tips to help you brew the best tasting coffee with your machine. Always use fresh, cold water, preferably filtered. Filtered water typically holds the ideal mineral content and will help give your coffee a fresh taste. Once you open a bag of your favorite coffee beans, it’s best to consume them within one week. Store them in an airtight container in a cool, dry place that is free of odors. Never store coffee in the refrigerator or freezer, as moisture can damage the flavor. For the freshest taste, it’s best to grind fresh whole bean coffee right before brewing. For drip coffee makers, the grind should be medium or similar to the texture of sand. If you find your brewed coffee tastes bitter, it may be over extracted or ground too fine. Alternatively, if your coffee tastes flat, it may be under extracted or ground too coarse. The amount of time the water is in contact with the ground coffee greatly affects the taste of your coffee. 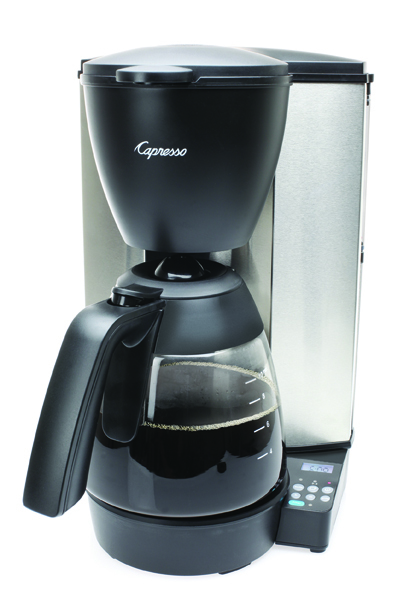 All Capresso coffee makers brew in less than 1 minute per cup. Coffee brewed for longer than this has a tendency to taste bitter. You can also experiment with the coffee grind size to help speed up or slow down brewing. Using finer grinds will yield in a faster brew, while using coarser grinds will help slow down the brewing process. Water temperature during brewing will affect your coffee’s flavor and extraction. The ideal water temperature during brewing is between 195°F – 205°F. Once the coffee is brewed into the carafe, the holding temperature is around 180°F. The serving temperature of coffee is between 155°F – 175°F, depending on personal taste. It is important to keep your coffee maker and coffee equipment clean. Descale your coffee maker every 2 -3 months if you have hard water, or every 6 months if you have soft water. Ensure the spray head, gold tone filter, filter basket and water reservoir are also clean and free of lime scale. We recommend using Capresso Cleaning Solution.